Some company just emailed to inform me that No Hesitations had made its list of the Top 100 Economics Blogs. I was pretty happy until I decided that there were probably only 70 or 80 economics blogs. But seriously, thanks a lot for your wonderful support. No Hesitations has about 500,000 pageviews since launching in summer 2013, and the trend (below) looks good. The time has flown by, and I look forward to continuing. Here's a continuation of this recent post (for students) on listening to writing. It's been a while since I did a piece on good writing, for students. In an old post I said "Listen to your words; push your prose toward poetry." That's perhaps a bit much -- you don't need to write poetry, but you do need to listen to your writing. On the listening theme, check out this Martin Amis clip, even if I don't see why you shouldn't repeat prefixes or suffixes in the same sentence (in fact I think the repetition can sometimes be poetic, a sort of alliteration, when done tastefully). And while you're at it, take a look at this marvelous older clip too. Glenn Rudebusch has a very nice 2016 FRBSF Letter, "Will the Economic Recovery Die of Old Age?". He draws on perspective and results from our joint work of 25 years ago (including a paper we did with Dan Sichel -- see below), and he applies them to the present expansion. He correctly emphasizes that U.S. expansion hazard functions are basically flat, so "old" expansions are no more likely to end than "young" ones. That's of some comfort, since the present expansion, which started in mid-2009, is getting long in the tooth! Perhaps the massive difference is due to "good policy", that is, post-war policy success in "keeping expansions alive". Or perhaps it's just "good luck" -- but it's so big and systematic that luck alone seems an unlikely explanation. For more on all this, and to see the equally-fascinating and very different results for recession hazards, see Diebold, Rudebusch and Sichel (1992), which I consider to be the best statement of our work in the area. At R/Finance 2016: Applied Finance with R. Interesting group, with many constituencies, and interesting program, which appears below (or go to http://www.rinfinance.com/agenda/). 09:05 - 09:35 Hsiu-lang Chen: Do Mutual Funds Exploit Information from Option Prices for Equity Investment? 10:15 - 10:45 Marjan Wauters: Smart beta and portfolio insurance: A happy marriage? Paul Teetor: Are You Trading Mean Reversion or Oscillation? I've always been a massive fan of statisticians whose work is rigorous yet practical, with emphasis on modeling. People like Box, Cox, Hastie, and Tibshirani obviously come to mind. So too, of course, do Leo Brieman and Jerry Friedman. I had the good luck to stumble into a week-long intensive lecture series with Jerry Friedman in 1989, a sort of summer school for twenty-something assistant professors and the like. At the time I was a young economist in DC at the Federal Reserve Board, and the lectures were just down the street at GW. I thought I would attend to learn some non-parametrics, and I definitely did learn some non-parametrics. 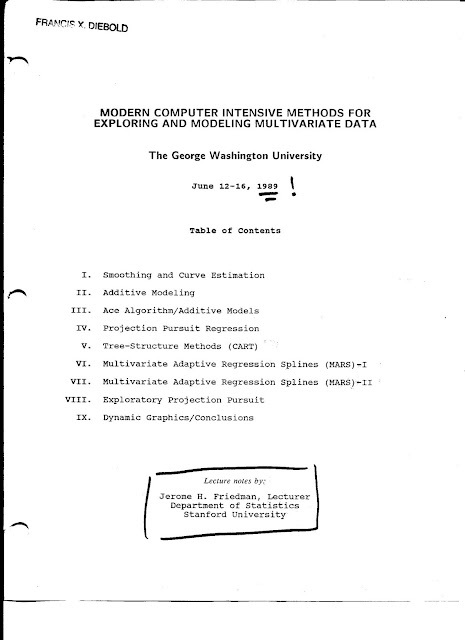 But far more than that, Jerry opened my eyes to what would be unfolding for the next half-century -- flexible, algorithmic, high-dimensional methods -- the statistics of "Big Data" and "machine learning". I just found the binder containing his lecture notes. The contents appear below. 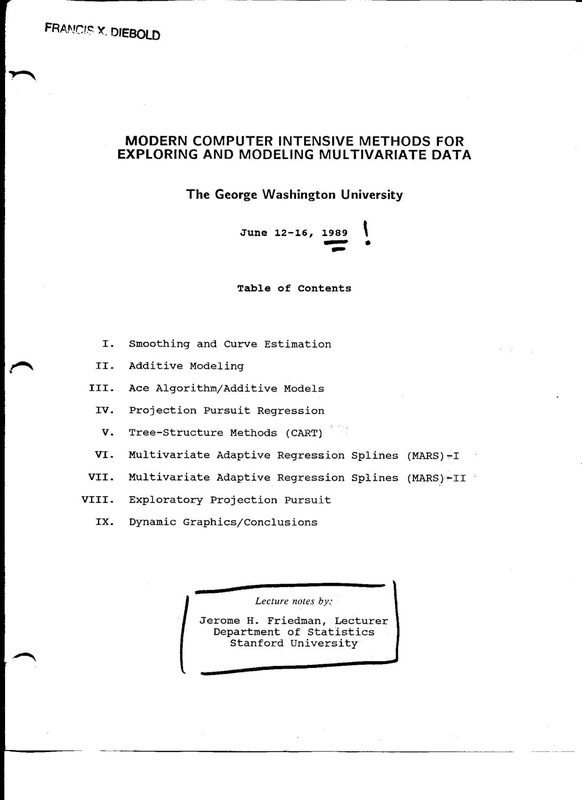 Read the opening overview, "Modern Statistics and the Computer Revolution". Amazingly prescient. Remember, this was 1989! 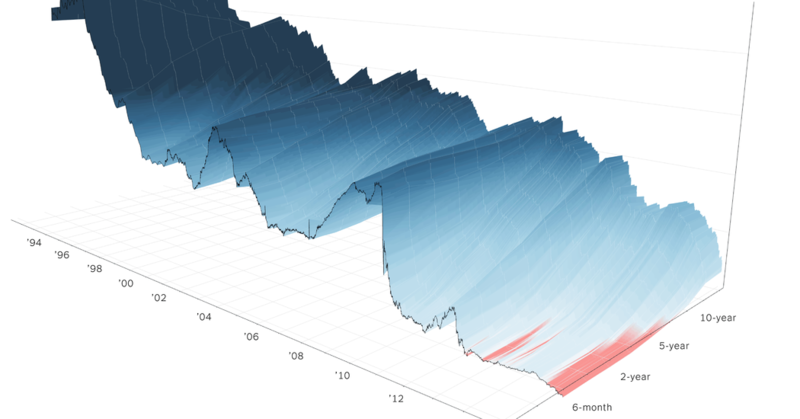 I'm giving an overview lecture today on certain aspects of yield curves and their modeling, which reminds me of this phenomenal NYT interactive graphic. CLICK HERE to get going, and give it time to load. Then click "next" to go through nine fascinating graphics, ending with Germany and Japan. You can also grab and rotate each graphic with your mouse. On the Origin of "Forecasts"
One hundred and fifty years ago Admiral Robert FitzRoy, the celebrated sailor and founder of the Met Office, took his own life. One newspaper reported the news of his death as a "sudden and shocking catastrophe". Today FitzRoy is chiefly remembered as Charles Darwin's taciturn captain on HMS Beagle, during the famous circumnavigation in the 1830s. But in his lifetime FitzRoy found celebrity not from his time at sea but from his pioneering daily weather predictions, which he called by a new name of his own invention - "forecasts". And quite apart from the origin of the term, the description of the early development of weather forecasting is fascinating. Gary Gorton has a fascinating new paper, "History and Economics of Safe Assets", which contains the quote of the week: "...almost all of human history can be written as the search for and the production of different forms of safe assets". Not sure that's the first cut I'd take at "all of human history", but it's certainly an interesting perspective. As the old maxim says: "When you have a hammer, everything looks like a nail". Here's to the the NBER's ongoing Conference on Research in Income and Wealth (CRIW), unsung hero, home of down-and-dirty measurement mavens since 1935. Yes, since 1935! Check out Chuck Holten's fascinating CRIW description in the NBER Reporter, and the full list of associated CRIW volumes published. What a stunning record of steady service. FYI a typical program (in this case, from last summer) appears below. Macro and Micro Dynamics of Productivity: Is the Devil in the Details? One hallmark of a great idea is that it's "obvious" (ex post). Fantastic recent work by Bollerslev, Patton, and Quaedvlieg (BPQ) certainly passes that test. Why didn't I think of that? I mean, really, the Barndorff-Nielsen and Shephard result is more than a decade old, and I know it well. Can I not put two and two together? Damn. But seriously, congratulations to BPQ.